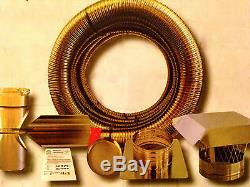 SMOOTHWALL CHIMNEY LINER TEE KIT 6 x 30 STAINLESS STEEL w/ CAP. EASY INSTALL MADE IN U. Our chimney liner kits are made with high quality continuous stainless steel material, which can be used to exhaust all types of flues. These kits can be used for pre-existing chimney flues or new construction. We sell to both residential and commercial customers. Your NEW KINGAIR Chimney Liner TEE Kit will include. 6 x 30' Finest Quality Stainless Steel Smoothwall Chimney Liner (316Ti). Great strength and flexibility; water and air tight; designed to reline existing chimneys or to be used in new construction. Manufactured using in the highest-grade mill certified alloys. Manufactured with a continuous strip of stainless steel. Important Information For Determining Size: The size given is the inside diameter. For the outside diameter of the liner. 13" x 13" Flat Top Plate w/ Connection Collar (24ga 304). You can easily trim it down to suit your needs. Tee Body -10 Long Tee Snout -Tee End Cap. This will keep water, debris and animals from entering your chimney flue. The item "Smoothwall 6x30 Chimney TEE Liner Kit (316) Stainless Steel Easy To Install" is in sale since Friday, November 21, 2014.